For most of the year, Greenland is white, but things are starting to change. Currently, Greenland is losing 350 gigatonnes of ice annually – 50% from ice melt, and 50% from glaciers moving into the ocean and breaking up into icebergs, which then melt. To put this into perspective, the loss of Greenland ice is six times the volume of all the glaciers we have in the Alps. And while it’s small in proportion to the huge amount of ice still in Greenland, it’s enough to raise the global sea level millimetre by millimetre each year. This should have more than just the glaciologists tracking these changes worried. Glaciologists know that Greenland has been melting more mass than it accumulates since 2000. That was a turning point. Scientists have very good measurements from about 1990 to today in terms of ice volume. From 1990 to 2000 Greenland was in balance: input-output was about equal. Input is the snow, and output is melt and ice that moves into the ocean. Today, we have a negative balance. And how do scientists know that? We have several methods: possibly the best is from a satellite called GRACE (Gravity Recovery And Climate Experiment) which has been measuring the mass of ice for over 10 years. Greenland accumulates mass (snow) in the winter and loses it in the summer. GRACE is unique because it can show us this on a weekly basis, so we can compare one week to another, one year to another, and in the future, one decade to another. Other satellites measure ice velocity – we can measure how much ice is flowing into the ocean. And NASA has measured ice thickness with ice-penetrating radar from aircraft since 2000. The European Space Agency does a similar job with satellites such as CryoSat2. On-the-ground data is also critical to understanding system change and calibrating modelling assumptions. The first automatic weather station was established on Greenland in 1990 at a research site on the western slope of the ice sheet, 80 kilometres from the coastal town of Ilulissat. Swiss Camp was purposively built at the “equilibrium line altitude” (ELA) – the point where the snow that falls throughout the year melts away in the summer. If you go further down towards the coast, you lose more mass than you gain, and the higher up you gain snow mass. So the ELA is the line of glacial balance, and that balance is changing. 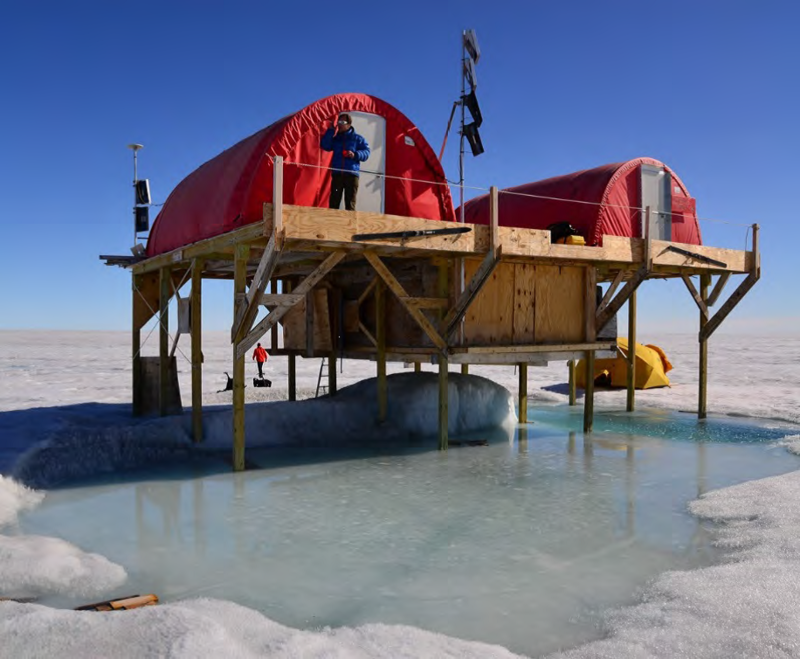 The ELA has moved approximately 50 kilometres inland since 1990, and 12 metres of ice have melted at Swiss Camp over the same period. That’s a big physical change, and one that is hard to ignore when you see it. All these pieces together point to the same fact: Greenland ice loss is real, increasing, and related to human-induced CO2 emissions. Worryingly, satellite data showed that the Greenland ice sheet surface melt has been increasing rapidly since 1979. The big question is, are these melt events continuing to increase? Or is it a repeat cycle? It seems that we now have more and more of these events. It was such an unusual event that even Rolling Stone magazine covered it in 2008. And that’s how some of the CEOs we work with learned about the climate risks associated with Greenland. This gave Greenland glaciology the sort of reach that scientific journals can’t achieve. Why would a CEO care if Greenland melts? Maybe they’re interested in opportunities from shipping, natural resource extraction or perhaps fishing and tourism. But there are other reasons. For instance, business leaders like Peter Bakker – CEO of the World Business Council for Sustainable Development – realized that Greenland is an important marker of the progress of global warming, and therefore an indicator of long-term global economic risk. Economists have reported the large economic risks from global warming since 2006. Estimates from 2014 suggest that the economic cost of climate change is even higher than originally thought. And such forecasts have done little to understand the economic risks from Greenland. Yet the Greenland ice sheet plays a significant role in reflecting sunlight back to space, known as the Earth’s albedo effect: less ice sheet means less sunlight reflected and a warmer planet. For example, the 50 kilometre change seen at Swiss Camp accelerates the loss of albedo. In the past, at the ELA point, the snow was very bright and 80 % of light was reflected. This albedo drops to 50 or 40% when you lose the snow because the ice is darker. Then the ice melts faster than when the extra 40% was reflected back to space. These are huge changes. In the past, solar energy was sent back to space, but now it stays at the surface and melts the ice further. That’s why the loss of Greenland ice accelerates climate change, creating economic risks in various industries. This April, Greenland started to melt earlier than normal, because it was hotter than normal. At one point, there was unexpected melting along its west coast, up to 2,000 metres in elevation. Normally, at this height, temperatures are supposed to be -20°C, but it was zero degrees. The maps show the melt area pattern on April 11 (left) and cumulative days of surface melting through April 17 (right) on the Greenland Ice Sheet. The graph above shows the daily extent of melt during 2016 through April 17, 2016 on the Greenland Ice Sheet surface, as a percentage (red line). The 1981 to 2010 average is shown by a blue dashed line. The gray area around this average line shows the two standard deviation range of the data. The good news is that we’re not losing the Greenland ice sheet as fast as the Arctic is losing summer sea ice. (Well, this is only partial good news: these physical transitions are intertwined, so it is only a generational delay). This kind of complete change takes probably a couple thousand years at the current rate. But economic risks are being incurred from the partial changes happening now – scientists know that the ice is melting, and a long-term view on economic risk needs to take that into account. Greenland is the biggest island in the world. If we put all the ice in Greenland into the ocean, the global sea level would rise by 6 metres, which would put the majority of the world’s coastal cities under water. With a temperature increase of 2°C by 2100, 130 million people would be affected by the rising ocean from the ice sheets in Greenland and Antarctica and the mountain glaciers. A 4°C climate warming would threaten between 470 million and 760 million people along the coasts. Megacities such as Shanghai, Tianjin, Dhaka, Kolkata, Mumbai, Hong Kong, Jakarta and Taizhou would be partly below sea level. Recent estimates indicate the global risk in terms of population and assets exposed to coastal flooding up to 2070. That should keep more than just CEOs awake at night. Greenland plays a huge role in the weather of the Northern Hemisphere. There are also worldwide weather effects. Greenland is like a big mountain switch, with the weather being affected by how wind and precipitation bounce off the mountain ridge. When we reduce the height of Greenland through glacier melt, it will eventually be able to change the circulation of air mass. Because it’s so high, Greenland acts as a weather machine for Europe. In the longer term, it could change dramatically, which would have a big economic cost. 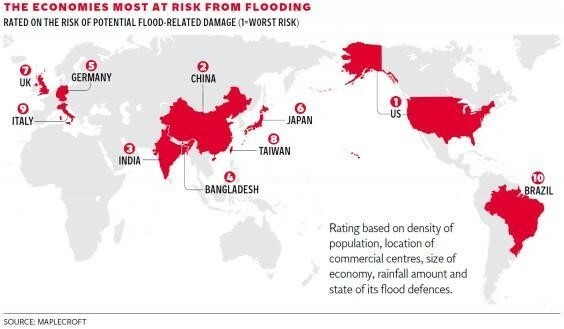 More extreme weather already brings greater economic risks for many industries and countries. A changing Greenland will only make this worse. When the author of the Rolling Stone article, Mark Binelli, came to Greenland, he worked at Swiss Camp. This first-hand experience with Greenland – and with glaciologists – was what helped him write such a good article. Politicians and filmmakers have also visited. For Greenland glaciology, this is part of the outreach. We already know how big a risk the changes are. Now we need the rest of the world to understand.